Summer is here and what better way to cool off then jumping into a nice, relaxing body of water. Ahhhh, refreshing! Well….for some, but not all! Just like humans many dogs enjoy a pool, lake or ocean during the summer, however not all dogs enjoy being in the water, nor do all dogs know how to swim! I sure don’t like swimming; in fact I can’t stand it! I don’t like baths either and I’m not too keen on drinking water. I pretty much like to steer clear of all water as much as possible! Even though I don’t understand the joys of swimming I do know that it’s very important to practice water safety with your dog. Here are a few things to always remember when it comes to dogs and swimming. Make sure your dog actually wants to swim. Are they afraid when you take them near water? (I am!) Do they get upset when you put them in water and immediately want to get out? (I do!) This probably means that your dog doesn’t want to swim or at least is unsure if they want to. Let your dog decide; don’t force them to become a swimmer. Do you have a dog that gets in the water without being asked? Or one that loves to play fetch in the water? Sounds like you have a water loving dog on your hands! People assume that all dogs can swim. This isn’t true! Can all humans swim? No! It’s important to find out if your dog can swim before you just send them into the closest body of water. 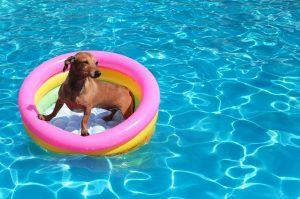 The best way to test if your dog can swim is in a pool so you don’t have to deal with waves or critters that can be scary or distracting to a dog. Wade into the shallow end while holding your dog (for those with larger dogs, do the best you can). Hold your dog in the water to see what they do. Many dogs will start paddling their feet before they even reach the water, some might just tense up. Slowly lower your dog into the water and see if they start paddling. If so, let go of them slightly and help them swim around. If your dog starts to sink, or their head goes underwater it probably means they don’t know how to swim or they don’t understand what they are supposed to do. It may take some time and a few lessons before your dog picks up on what they are supposed to do. Let them move at their own pace and don’t force them to swim if they don’t want to. PS: If you find out that your dog can’t swim (or just doesn’t like it), it doesn’t mean there isn’t another way for them to cool off in the summer heat. Buy a kiddie pool, fill it with a small amount of water and see how your dog does with that. This will be a lot less scary for them and it won’t require any swimming. Just because your dog goes in the water doesn’t mean they will be perfect swimmers (perfection takes time, even for a dog!). Dogs need to be taught the right and wrong way to swim. Does your dog understand that they are supposed to paddle with their front and back paws? Many dogs will only paddle with the front which will cause lots of splashing and not much progress. Your dog might need a little help learning how the front and back work together to keep them moving through the water. Next, your new swimmer needs to know where their exit is. Obviously, a lake or ocean won’t be as big a problem. If your dog is swimming in a lake or ocean, make sure they know to swim back to you and not to keep going towards the horizon. Exiting a pool can be a big problem. Your dog’s first instinct is to go to the closest location to exit. This means that most will go straight to the pools wall and try to climb over the edge. Most dogs are unable to lift themselves over the edge so they need to know where the steps are. Once your dog gets the hang of swimming on their own, start guiding them to the steps so they know the right and easy way to exit. Just like with other training, praising and rewarding a dog when they exit via the steps will help them learn what they are supposed to do (just another excuse for a yummy treat!). If you have a dog that is a swimming pro that doesn’t mean your job is done. It’s important to make sure that your dog knows water manners. You don’t want a dog that jumps into any body of water they see. You also don’t want a dog that could hurt an adult or child who is swimming around them. As the owner, you need to make sure your dog uses proper manners while swimming and that he/she listens to your commands during this time. Where can your dog swim? There are many bodies of water available for your dog’s enjoyment but each comes with its own set of risks. Pool: While you don’t have to worry about critters in a pool, you do have to worry about your dog’s skin. Chlorine can irritate skin and ears. It’s important to make sure that you give them a bath or rinse them with water after pool fun. In addition, you have to watch your dog around the edges of pools. They could get very excited and slip and fall, causing injury or they could injure themselves on the hard, rough edges while playing in the pool. Ocean: Critter alert! Even though your dog shouldn’t be going that far into the ocean there is still a risk of jellyfish and sometimes sharks if your dog swims in the ocean. Don’t forget about the risk of rip currents! Just like humans, a dog can easily get caught in the tide and get sucked under. Most beaches that allow dogs are calm, but it’s best to keep a very close eye or go in the water with your dog. There is also a possibility that in all the excitement your dog could swallow large amounts of salt water. This could easily upset your dog’s stomach and cause them to throw up or have diarrhea. Make sure that lots of fresh water is available during ocean swim time so your dog isn’t tempted to consume more salt water than necessary. Lake: You will find that many dog parks have lakes for dogs to play/cool off in. While this can be a very fun place, it also comes with risks. Many lakes contain alligators (at least in the South!) and snakes. Also, lakes can have many different forms of bacteria that can make your dog sick. Even though parks are required to post a warning about a bacteria outbreak, you never know how your dog will be affected. One dog might have no issues, while another could become very sick. Heat from the sun is much more intense when around water. Be sure to use sunscreen, keep your dog hydrated and protect their paws from hot sand/concrete. You don’t want fun playtime to turn painful afterwards. What should I do with my dog after a swim? I could go on and on about all the things in a pool/lake/ocean that can make a dog itchy, stinky or just plain gross. Eww…don’t get me started! It’s best to bath or at least rinse off your dog after swimming to get all the yuckies off. Aren’t these only for boats? No! Life preservers have many uses when it comes to dogs. Swim time can be so fun for dogs that they don’t know when they have gotten too tired to properly swim. If you have a dog like this you might want to get them a life preserver so you don’t have to worry about a near drowning. Also, life preservers come in really bright colors so they are really great for keeping track of your dog when swimming in lakes/oceans and around lots of other dogs. Lastly, life preservers are great for worrisome parents. They are just an added safety measure to make sure your furry family member stays safe while in the water. Never let your dog swim without supervision. Some dogs won’t go swimming unless their owners do or unless they are told. However, there are many dogs that will jump in a body of water as soon as they see it. It’s very important that your dog have constant supervision when swimming. This will allow you to monitor how tired they are getting, watch out for any hazards and overall keep them safe. Use a leash to help it. Just because your dog is swimming doesn’t mean they can’t get over heated or overly tired. It’s important to make sure that they are getting proper water and rest when enjoying swim time. Dogs will play until they drop; it’s your job to make sure this doesn’t happen. Now that you know all there is about swim safety why don’t you head on out and take a couple laps with your dog!